the Glengair (an Aberdeen trawler) in 1972 where she stood by with the Stromness lifeboat, she removed 8 crew taking them to Longhope before an about turn to stand by, the service lasted 29 hours. 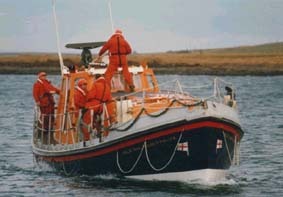 the Ross Tern (a Grimsby trawler) in 1973 (which earned her cox a bronze medal) which came ashore on the Tarff Tail on Swona. The Lans (a Danish trawler) in 1974 where she stood by for 13 hours while the crew of 9 men were rescued by helicopter from the Lans at the base of a 600 ft cliff face. 1973 Bronze medal awarded to Coxswain Jack Leslie for the rescue of the crew of eleven of the trawler 'Ross Tern' which was hard aground on the Tarf Tail, Swona Island. 1974 Centenary Vellum awarded to Station.